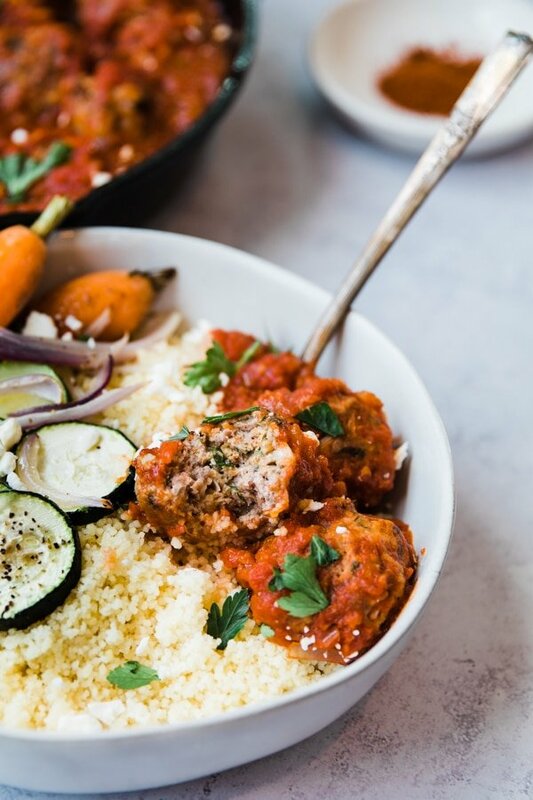 Harissa Lamb Meatballs are spicy meatballs that make for a delicious dinner and are great for meal prep! What a week it’s been! (One more day until Friday! Woo!) We have had a lot of wedding planning this week. We attended our first marriage counseling session which went well. We are learning more and more about each other every day! In addition to that, we also went food tasting for the wedding as well! I think we tried about 5 different types of potatoes…So hard to choose the BEST ones! In other news, I am still on the mission to providing you with tasty and healthy weeknight dinner recipes. It’s my goal to make this blog practical and a great resource for realistic dinner options for you! First off, Harissa. What is it? Flavor: It is a blend of hot chile peppers, garlic, olive oil and spices such as cumin, coriander, caraway and mint. It is a staple in North African and Middle Eastern cooking! What else, besides these delicious meatballs, can I use harissa for? What can you NOT use it for?! Both the powder and harissa paste can be used to enhance the flavor of a variety of foods! It can be used in burgers, roasting vegetables, to enhance soups, stews, appetizers and main dishes. You can use it as a marinade for meat and fish or even blend it into hummus or any of your other favorite dips! You can use it in salads dressings, on a rub for meat, in your yogurt, pasta and even chicken wings. Told ya, possibilities are endless! Can I make my own harissa paste? Yes! You can make your own harissa paste. 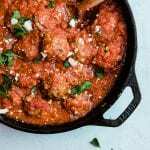 This recipe can use the powder or the paste, so whatever you have on hand will work well for these harissa lamb meatballs. Making your own harissa paste in incredibly easy! First you will toast 1 teaspoon cumin seeds, 1 teaspoon fennel seed, 2 teaspoons coriander seeds, 2 teaspoons dried chili flakes over medium heat in a pan until fragrant. Grind in a pestle and mortar until fine and set aside. Then using a food processor or powerful blender, combine 2 red bell peppers that have been charred with skins removed, 6 garlic cloves, 28 oz. can crushed tomatoes (juice drained), 1 Tbsp. smoked paprika, 2 jalapeños, 6 Tbsp. olive oil and salt and pepper to taste. Add in the spices and then voila! Harissa Paste! 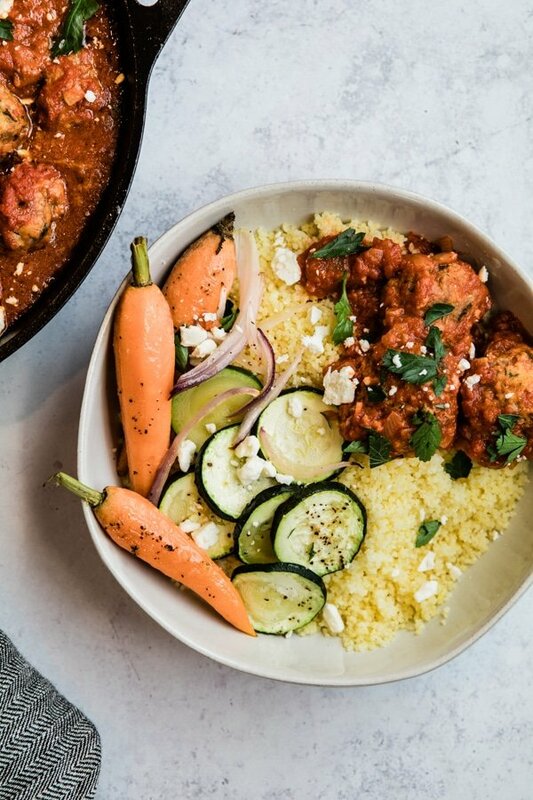 You can serve these meatballs as is for an appetizer or you can make it into a meal and serve with roasted veggies and a grain (like couscous or rice). Why lamb? Can I use ground turkey? I’m always eating ground turkey and chicken. Lamb is incredibly tasty and easy to work with in the kitchen. NOT intimidating like everyone makes it out to seem. A single 3 ounce portion of lamb provides over half of your daily protein needs which is ideal fuel for active bodies. With all of the Pilates and yoga I am involved in, it’s nice knowing I can get a great source of protein from lamb. If you’re looking for more yummy lamb recipes one of my favorite chili recipes is made with lamb! 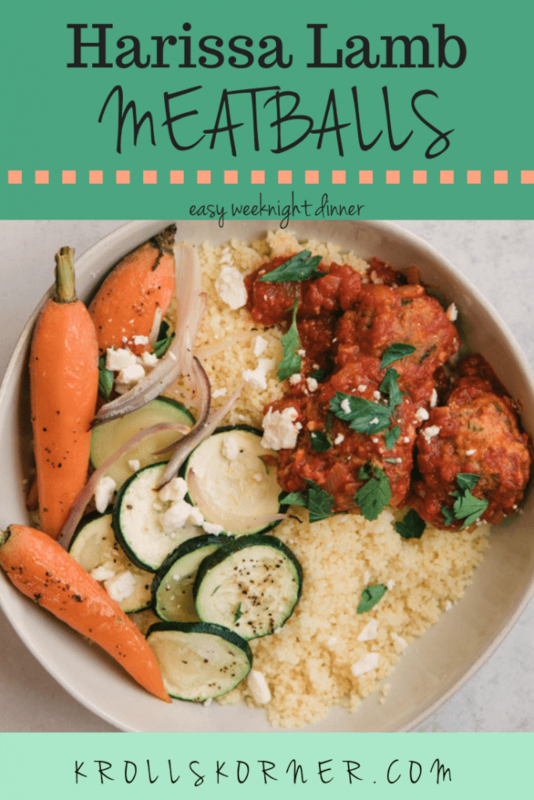 I love how the possibilities are endless when it comes to meatballs and I hope you enjoy this new way to enjoy the flavor of lamb and meatballs! Appetizers or can be a full meal! 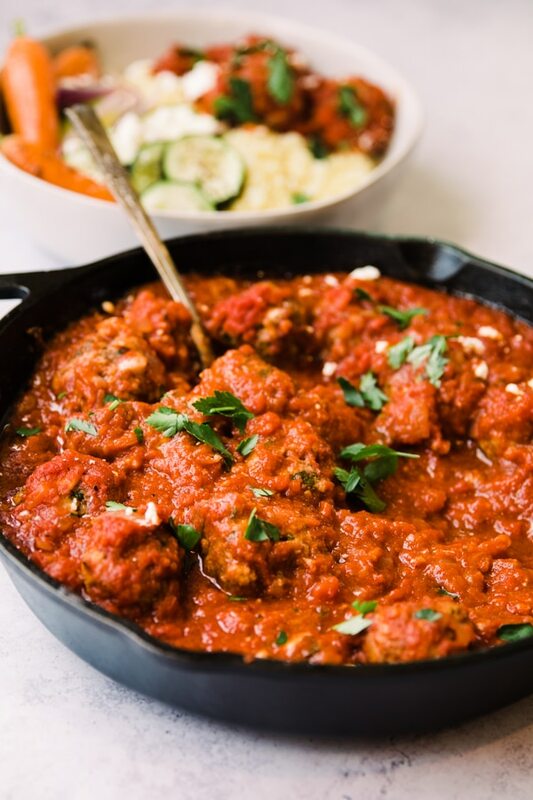 These meatballs taste like a red pepper sauce with a kick and filled with fresh herbs! Preheat the oven to 375 degrees F. First make the sauce. Heat olive oil in a large pot over medium high heat. Saute onion until translucent and soft, around 4-6 minutes. Add crushed tomatoes, tomato paste, and remaining seasoning. Simmer for 30 minutes. (You may need to add 1/2 cup water to make the sauce a consistency you prefer). In a large bowl, make the meat balls. Use your hands to combine all ingredients together. Being careful not to overwork the meat. In another pan on the stove heat 2 Tbsp. olive oil and sear the meatballs for 2-3 minutes on each side. Then place the meatballs in the sauce in an oven safe dish (like a cast iron) and bake for another 15 minutes, or until the meat is cooked all the way though. (160 degree F to be safe). Serve with couscous/orzo/rice and fresh veggies! 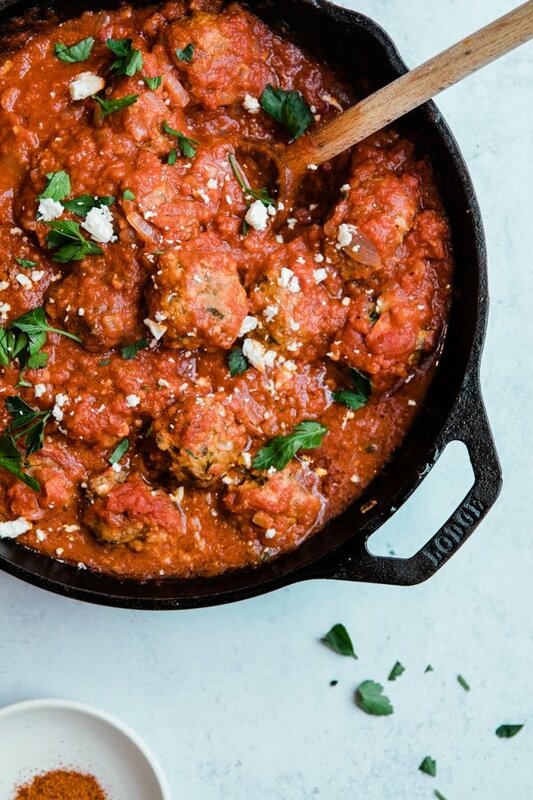 PIN THESE HARISSA LAMB MEATBALLS FOR LATER!